After the initial release of the iPod Touch® in 2007, the Apple iPad® was released just three years later in 2010. Parents, teachers, clinicians, and advocates of individuals with a diagnosis of autism have since flocked to adopt the new technology. For example, a Google search of “autism and iPad app” produces over 13 million hits, and Autism Speaks lists 400 iPad® applications on its website as appropriate for autism treatment. Because autism has long been plagued with “Miracle of the Month” treatments, it is essential that parents, teachers, clinicians, and advocates rely on a research base to inform their use of technology in autism treatment. It is equally important that researchers produce high quality research to inform the use of new technologies in autism treatment. According to the Center for Disease Control, 1 in 68 births results in a diagnosis of autism. In accordance with the American Psychiatric Association, a diagnosis of autism is applied when an individual demonstrates impairments in social communication and social interaction, as well as, repetitive and restricted interests. Furthermore, it is estimated that 30% of individuals with autism fail to develop speech capabilities. Given the impairments demonstrated by individuals with autism, coupled with those individuals who fail to develop vocal output capabilities, it is often necessary to incorporate the use of an Augmentative and Alternative Communication (AAC) system when establishing a verbal behavior repertoire for individuals with autism. 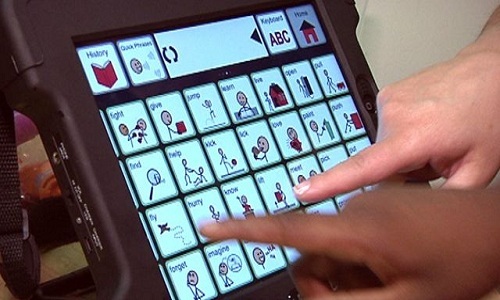 One such method of AAC is the speech-generating device (SGD). A SGD is an electronic device that relies on the speaker’s pressing of a picture, word, or symbol with enough force to evoke a digitized output, which typically occurs in the form of speech production. For example, if a child wants a “cookie,” he or she can press the picture, word or symbol that represents “cookie” and a digitized output of “cookie” will be produced by the device. Dozens of SGDs exist and range greatly in technological capabilities and cost. One of the most technologically capable SGDs on the market is the Dyna Vox Maestro, which possesses Wi-Fi capabilities allowing complete customization of the device for its user. According to its manufacturers, the Dyna Vox Maestro costs roughly 8,000 US dollars. Recent technological advancements in the development of handheld computing devices…combined with the development of applications that present an interface comparable to a SGD… have made SGD more affordable and available. Recent technological advancements in the development of handheld computing devices, such as the iPad®, combined with the development of applications that present an interface comparable to a SGD (i.e., Proloqu2Go™) have made SGD more affordable and available. For example, an iPad Mini® can be purchased off the shelf from Apple or Best Buy for 249 US dollars. The application Proloqu2Go™ can be purchased through the device’s “App Store” for 219 US Dollars (this is a one time purchase and the application can be shared across multiple devices). For a combined cost of 468 US dollars, the iPad Mini® can be transformed into a device that presents all of the capabilities of the Dyna Vox Maestro. So, we know that these new technologies are cheaper and more available, yet the question of “do these consumer products really work?” remains. Fortunately, the research community has responded, building an evidence base for such use. In a recent review of the literature on the use of handheld technology in the development of verbal behavior, researchers Lorah, Parnell, Whitby, and Hantula (2014) identified 17 studies published between 2007 (the iPod®’s release year) and March of 2014 investigating the use of handheld technology as SGD for individuals with autism. …for of the total 57 participants included in these 17 studies, 93%, or 53 participants acquired the ability to communicate using the iPod® or iPad® as a SGD. The results of these 17 studies are favorable, for of the total 57 participants included in these 17 studies, 93%, or 53 participants acquired the ability to communicate using the iPod® or iPad® as a SGD. Furthermore, in those studies that compared participant preference between the new technology as a SGD and other methods of AAC such as Picture Exchange or Sign Language, there is a clear indication that the new technology is preferred. Of the total 19 participants involved in comparisons studies, 84%, or 16, demonstrated preference within the research design for new handheld technology, such as the iPad®. …in those studies that compared participant preference between the new technology as a SGD and other methods of AAC such as Picture Exchange or Sign Language, there is a clear indication that the new technology is preferred. Given the differences in individuals with autism, the preference of participants for the technology based SGD is compelling, yet not all that surprising. Perhaps the preference is due to the fact that the iPod® or iPad® used as the SGD in these studies is a generally preferred consumer technology? Or perhaps it is because children with autism respond well to the game-like interface? Regardless, it remains an important finding because well-liked technology will be used. A child will be motivated to learn and use a device if it is liked; this is not a trivial point when we look at a child with autism. The results regarding the effectiveness of the devices included in the review are also not unexpected. If we look closely at the intervention procedures, what we see embedded is a use of research-based behavioral teaching strategies, such as shaping, prompting, and reinforcement. As such, one must never succumb to the “hardware happiness hype” and mistake the mere use of new technology as an appropriate substitute for the intervention process. However, it stands to reason that if we combine such methods as prompting and reinforcement with any interface the outcome would be positive given the overwhelming research, which supports such procedures. Thus, the natural next step is the development of technology that inherently incorporates such behavioral teaching strategies and a research base to accompany it. …the natural next step is the development of technology that inherently incorporates such behavioral teaching strategies and a research base to accompany it. It is clear that the basic question of “do these consumer products really work as SGDs?” is affirmative. However, one must not forget that it is the combination of behaviorally based teaching strategies and these new technologies that are together effective in the development of a verbal behavior repertoire for individuals with autism. Without the use of behaviorally based practice in the teaching process, one would find that the technology alone, even new and attractive technology, is no more useful than a rock. Elizabeth R. Lorah, Ph.D., BCBA-D, is an Assistant Professor at the University of Arkansas in the Applied Behavior Analysis program. She has worked as a Behavior Analyst for early intensive behavior intervention programs in the tri-county area of Philadelphia, as well as in Northwest Arkansas. Her research interests include the use of technology in behavior analytic treatments for autism. She has recently published manuscripts evaluating the use of handheld technology in the development of verbal behavior in young children with autism. Alison Karnes, M.A., is a first-year doctoral student at the University of Arkansas studying Applied Behavior Analysis and Autism Spectrum Disorders. She currently works within the Arkansas Autism Partnership, which provides behavior analytic treatment for young children with autism. Her research concentration addresses the effects of using iPad technology for improving language development in individuals with Autism Spectrum Disorders and other communication disorders. Renee Speight, M.A., has been teaching and working with children and educators throughout Arkansas for five years. She has a Masters of Education in Special Education and is currently completing a PhD in Curriculum and Instruction from the University of Arkansas. She is also seeking to become a Board Certified Behavior Analyst. Renee is the Social Media Liaison for Arkansas Association of Middle Level Education and has presented on various topics at multiple conferences and workshops throughout the state.